Home Community News 1 Year of Uptime! Fixed a bug with friends of the clan-chat not showing up in the minimap as a clan-chat member. Fixed quite a few bugs with the Ignore list. Fixed a couple of bugs with the Friends list including double-logins showing up for staff members who had PM alerts enabled. Fixed a bug with the dialogue system sometimes flagging you as busy when you wouldn’t actually be busy. Fixed a bug with the Genie. Fixed a bug with Potions. Fixed a bug with Consumables. Fixed a bug with the Herblore Skill guide and added the Super Antifire Potion to it. 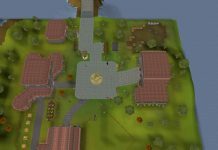 Fixed a critical game bug with the Gnome Agility Course. Fixed the hit-splats for the Inferno Jad, they are no longer delayed by 3 ticks. Fixed a bug with certain NPC’s only hitting with their Magic attack while they were set to both Range and Magic. Fixed the Inferno Jad desync. Fixed a pretty bad bug with how the network system handles packets. Fixed a bug with defensive casting Magic not properly rewarding the defense EXP. Fixed a type while eating Shrimp. Fixed a bug with the Mystery Box at the donator zone not working for Ironmen. Fixed a bug with the recent cache update. Fixed a bug with the dialogue option system. Fixed a typo in the boss teleport menu. Fixed a bug with the special attack bar. Removed all profile privacy settings. Using an item on a banker NPC will now note/unnote your items. Added 10 more NPC Combat Definitions. The party system interface will now allow you to teleport to any player who’s inside the same raid & party that you’re in. Hardened the HWID even more to help prevent collisions. Raw Sea Turtles are now stackable. Trimmed a few MB off the .jar file size. Slightly adjusted the header of the error logs. The Makeover Mage no longer charges you to change your appearance. You can now make Crushed Superior Dragon Bones. Added the ability to make Super Antifire Potions by using Crushed Superior Dragon Bones on an Antifire Potion at 92 Herblore. Added the Super Magic Potion. Added the Super Ranging Potion. You can now make Super Magic Potions with Torstol Potion(unf) + a normal Magic Potion at 87 Herblore. You can now make Super Ranging Potions with a Torstol Potion(unf) + a normal Ranging Potion at 89 Herblore. You can now trade Super Antifire, Super Magic and Super Ranging Potions. Made Vorkath slightly easier by adjusting the time it’ll take for his cannon attack to kill you. You can now Melee Vorkath. Removed the ‘Empty’ option from all of the drinkable potions. Updated the Party System Interface. Buffed both Rapiers by swapping the Stab and Slash attack styles. Changed a few of the announcements. Buffed the Scythe of Vitur. Slightly buffed the Abyssal Bludgeon. The Inferno Jads Trio will now spawn in a proper triangle. You can now eat the Spinach Roll. If the client experiences a JVM error, it will now properly log that to disk. It will also close the client to prevent resource leakage from the crash. Adjusted the crash system a bit more, it’l now pop up a dialogue explaining what happened and gives you the option to open the error-log folder. Removed the chests at the boss event area, client sided. Adjusted the buy message for when someone buys something from your POS, it will now include their username. Buying from the player owned shop will now remove GP from your coin pouch as well as from your Inventory. Added the UNO(;;u) card game into the game client! It’s still a super WIP and has a couple of bugs but it’ll be updated over the new few weeks to become a full fledge Minigame. Next articleNew Gear, More Combat and More! On the road to Fruition!